As America's symbol of Great Music, Arturo Toscanini and the “masterpieces” he served were regarded with religious awe. As a celebrity personality, he was heralded for everything from his unwavering stance against Hitler and Mussolini and his cataclysmic tantrums, to his “democratic” penchants for television wrestling and soup for dinner. During his years with the Metropolitan Opera (1908-15) and the New York Philharmonic (1926-36) he was regularly proclaimed the “world's greatest conductor.” And with the NBC Symphony (1937-54), created for him by RCA's David Sarnoff, he became the beneficiary of a voracious multimedia promotional apparatus that spread Toscanini madness nationwide. 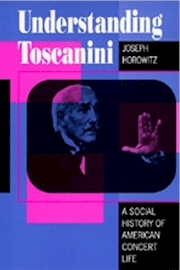 According to Life, he was as well-known as Joe Dimaggio; Time twice put him on its cover; and the New York Herald Tribune attributed Toscanini's fame to simple recognition of his unique “greatness.” In this boldly conceived and superbly realized study, Joseph Horowitz reveals how and why Toscanini became the object of unparalleled veneration in the United States. Combining biography, cultural history, and music criticism, Horowitz explores the cultural and commercial mechanisms that created America's Toscanini cult and fostered, in turn, a Eurocentric, anachronistic new audience for old music.